His long-term sojourn in, and very strong loyalty to, Lidzbark Warmiński (Heilsberg) in 1503-9 was a formative period in the life of Copernicus in terms both of his personal and scholarly development. In the mid-14th c. the strongly-fortified gothic castle had become the see of the Bishops of Warmia and the administrative centre of their dominium. This had a beneficial influence on the development of the town which, according to a census held at the beginning of the 16th c., had a population of 2,000 and was one of the largest urban centres alongside the Hanseatic town of Braniewo (Braunsberg). Lidzbark was also the place where Warmian sejmiks convened. In 1489 the newly-appointed Bishop of Warmia, Lucas Watzenrode, an uncle of Copernicus, took up residence in Lidzbark and soon became a powerful public figure known not only in Royal Prussia (Prusy Królewskie) but in the rest of Poland as well. He was a senator in the Polish parliament and a counsellor to three successive Polish kings: John I Albert (Jan Olbracht), Aleksander Jagiellon (Aleksander Jagiellończyk) and Sigismund the Old (Zygmunt Stary). 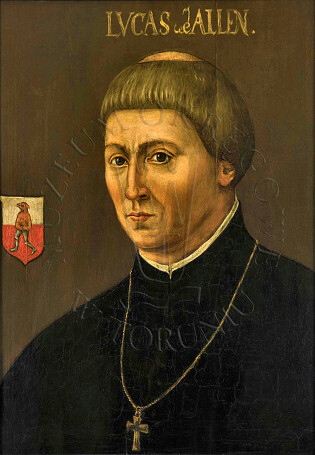 He even made plans to drive the Teutonic Order out of Prussia and move it to Podolia (Podole), and to release his diocese from its suffragan connexion with the metropolitan see of Riga. He played an important role in the political life of Royal Prussia and in trying to impose his will came into conflict with the larger urban centres (chiefly Gdańsk). The governorship of Prussia was also sought and from 1508 he presided over the Prussian Council (Rada Pruska) which administered the province. Lucas Watzenrode dreamt of an ecclesiastical career for his nephew, Nicolaus Copernicus. In 1495 he invited him to Lidzbark hoping that after the death of Johannes Zanau (26 August 1495) he would manage to secure for his relative the then vacant canonicate in Warmia. This was the time when Copernicus had a chance to take a closer look at what lay behind the dispute with the grand master of the Teutonic Order over the refusal by the bishop to give supremacy rights regarding spiritual matters in that part of the diocese located within the boundaries of the Teutonic State. In February 1496 a meeting was held between Watzenrode and a group of envoys from the Order during which Watzenrode was informed that it had filed a lawsuit against him before the Apostolic Tribunal of the Roman Rota. The angry bishop had a letter written in which he authorized his secretary Georg Prange to file a protest in Królewiec (Königsberg) against the procedure followed and hand over a statement that Watzenrode was also ready to appeal before the Roman Rota. Copernicus was among the witnesses of the document signed on 22 February 1496. Soon afterwards he left Lidzbark to read law in Bologna and it was there that he learnt he had received a canonicate in Warmia which he undoubtedly owed to his uncle as much as his office of Scholasticus at the church of the Holy Cross in Wrocław. In 1503 Copernicus returned to Warmia as a young doctor of canon law and a physician. He was sent to Lidzbark not only to take care of his ageing and ailing uncle but to assist the bishop in administering the current internal and external affairs of the diocese. His position allowed him to witness a good number of official visits and gave him an insight into the bishop’s policy towards the chapter and the Prussian Council, as well as towards the Teutonic Order and also the court of the Polish King. Copernicus aided the bishop at the time of conflicts over borders with Gdańsk (Danzig), Elbląg (Elbing) and the Order, drawing up several maps of disputed territories. Accompanying Watzenrode, he took part in several assemblies of the ‘Prussian estates’ and meetings with the Polish King Aleksander who, in the spring of 1504, visited Royal Prussia to receive the oath of fealty that was due to the Polish Crown. Similarly, in the summer of 1506 Copernicus took part in the debate of Prussian delegates with commissioners for the Polish King in Malbork (Marienburg). On 24 January 1504 Copernicus witnessed the coronation ceremony of Sigismund the Old (Zygmunt Stary) in Kraków. In early September the same year, Copernicus accompanied the bishop to an assembly of the ‘Prussian estates’ in Elbląg (Elbing) summoned to discuss, among other important issues, current tax affairs and the problem of how to deal with the growing brigandage supported by the Teutonic Order who were straining to undo the Treaty of Toruń (Thorn) of 1466 and regain the territory lost according to its provisions. The same issue was later discussed at the Sejm (the Polish parliament) that convened in Piotrków (9 March-16 April 1509) where Lucas Watzenrode and his nephew were present as Prussian delegates. Copernicus also accompanied his uncle at an international assembly in Poznań (Posen) in June-July 1510 which was another attempt to settle the dispute between Poland and the Order. Unfortunately, in spite of the presence of envoys sent by the Holy Roman Emperor Maximilian I, the German Reich and King Casimir Jagiellon (Kazimierz Jagiellończyk), the deliberations came to nothing because of the Order’s uncompromising attitude. Time permitting, Copernicus pursued his own interests availing himself of the rich resources of the bishops’ library and it was in Lidzbark that he completed the first draft of his heliocentric theory entitled Commentariolus (ca. 1509). In late 1509 Copernicus published in Kraków the letters of Theophylact Simocatta in his own translation from Greek to Latin (Theophilacti scolastici Simocati epistolae morales, rurales et amatoriae interpretatione latina) which he dedicated to Watzenrode. Through that dedication Copernicus thanked his uncle for his long-lasting protection and bid his farewell to the despotic bishop who, as recorded by one of his secretaries, ‘would never smile’. There is no doubt that Copernicus was grateful to his uncle not only for making it possible for him to quietly work on his theory of the Earth’s orbit but also for giving him another chance to gain firsthand experience in administrative matters and an insight into the intricacies of the bishop’s policy towards Prussian cities, the Teutonic Order and the Polish King. Although Watzenrode made every effort to carve out a distinguished ecclesiastical career for his talented nephew (he dreamt of seeing him as Bishop of Warmia and he even obtained from Pope Julius II a written authorisation dated 29 November 1508 granting his nephew two further prebends), Copernicus did not return to Frombork until the summer of 1510. It was recorded that on 19 January 1512 he was present when Watzenrode was setting off to take part in the coronation ceremony of Barbara Zapolya, however, it seems that he did not accompany his uncle on that journey. Neither did he witness the bishop’s death on 29 March 1512, but he did participate in his funeral on 2 April in Frombork and later funded an epitaph to his powerful uncle. Later, Copernicus visited Lidzbark only sporadically either as a canonical delegate or a physician to the successive bishops Fabianus Lusianus (Fabian Tetinger von Lossainen; d. 1523), Mauritius Ferber; (1471-1537) and Johannes Dantiscus (Johann von Hofen; 1485-1548).